Nigerians, suffering from six years of conflict between Boko Haram Islamist militants and Nigerian troops, are getting relief from international aid groups. Two aid projects in northern Nigeria are benefiting children who were displaced from their schools and women who have been widowed by the fighting. One project operates about 300 informal learning centers in northern Nigeria's Bauchi, Gombe and Adamawa states, so that students driven from their schools by Boko Haram militants can still get an education. Washington-based nongovernmental organization Creative Associates International runs the learning centers with funding from the U.S. government's Agency for International Development, or USAID. The program relies on support from Nigerian community leaders who provide safe spaces for the traumatized children, according to the group's director of education in conflict zones, Eileen St. George. "We can come in with great ideas and help mobilize a community to realize their own need and how to respond to it, and provide them some of the technical capacity to build the knowledge and the skill sets to implement the program," St. George told HashtagVOA this week. "We're working side by side with the communities, local governments and states to make this happen. They are the ones bringing in these kids." The U.S. NGO says more than 1 million Nigerian children have been displaced by Boko Haram's six-year insurgency. The group's education crisis response program, which marked its first anniversary this month, is designed to give those children not just learning opportunities, but also psychosocial support and in-class meals. St. George said her group has enrolled 20,000 displaced children so far and hopes to reach 59,000 by the end of the three-year project. Nigerian children at non-formal learning center run by U.S. NGO Creative Associates International, northern Nigeria. "I would say we are touching just a drop in the bucket," she said. "There are so many more children and youth out there. When you help stabilize the children and the youth, you are stabilizing an entire family and the community around them." In another program, thousands of widows who have lost husbands in the insurgency have registered with the International Committee of the Red Cross. Widows registering for monthly foods supplies from the ICRC in Maiduguri, Nigeria, September 2015. 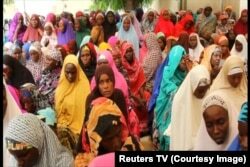 The Red Cross is working with the widows association of northeastern Nigeria's Borno state to help the bereaved women start small businesses with $200 grants. Amina Lawan used the money to buy three sewing machines and open her own tailor shop. Her husband was killed three years ago. "When I became a widow, sometimes it was difficult for me to eat three times a day because there was no money," Lawan said. "There were school fees for the children. Everything was so hard." Amina Lawan, Nigerian widow and beneficiary of ICRC’s Micro Economic Initiative, in Maiduguri, Nigeria, September 2015. Nigerian President Muhammadu Buhari, who took office in late May, has ordered his military chiefs to quash the Boko Haram uprising by the end of this year. Defense officials have said they are on course to meet that deadline. Human rights organizations often have accused the Nigerian army of violating human rights in the fight against Boko Haram. The army denies that accusation.